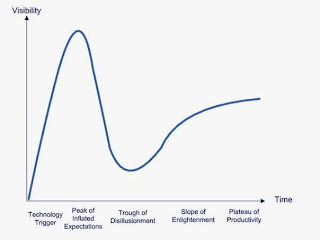 Gartner Hype Cycle - second coming of the internet - heading towards a plateau of productivity or another peak of inflated expectation? Saw this again recently and thought the 'second coming of online' could be interpreted using this model? Launch of the worldwide web was the technology trigger, dotcom boom = peak of inflated expectations, bubble burst = trough of disillusionment, forward thinking companies persisted and discovered new ways of connecting = slope of enlightenment - but where are we now?